I would guess that most people would imagine a reasonably sized fruit bat, with a wingspan of maybe 20 centimetres. A furry, rodent-like animal with black eyes and a pig snout. Black wings. How big do you think a bat can get? Prepare to fall off your chair. 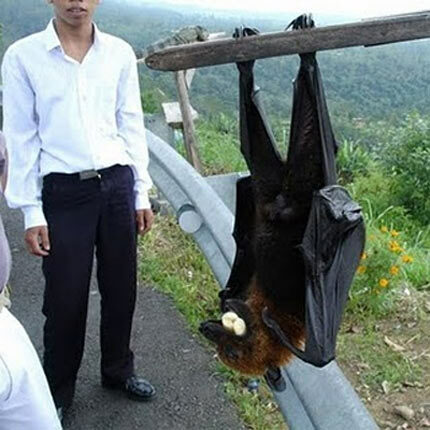 Behold: the giant golden-crowned flying fox. It’s not a bat! It’s a dog with leathery wings! It’s a flying Fido! The giant golden-crowned flying fox (or Acerodon jubatus) is the largest known bat in the world. Its wingspan is on the order of one and a half metre! That’s five feet from wingtip to wingtip! Can you imagine the gale force wind this flying fox generates on take-off? This mammal weighs up to 1.2 kg (2.6 lbs), which is about the weight of a human brain. This is surprising given their enormous size, especially since their bones, unlike birds, are not hollow. You’d have to hold three of these giant flying foxes in your arms to equate the weight of an anorexic bichon frisé dog. What does such a foxy creature eat to maintain a svelte figure? Fruits. Well, no wonder. This cute-albeit-frighteningly-large animal not only eats fruits but earns itself a civic medal by scattering the seeds from those fruits all over the rainforests of the Philippines, an act which is vital to these ecosystems. 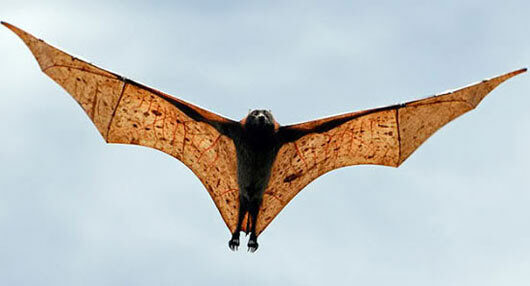 A similarly large flying mammal, the Malayan flying fox, has had its wingspan measured as up to 6 feet! Like humans, these humongous bats generally give birth to one offspring at a time, rarely twins. 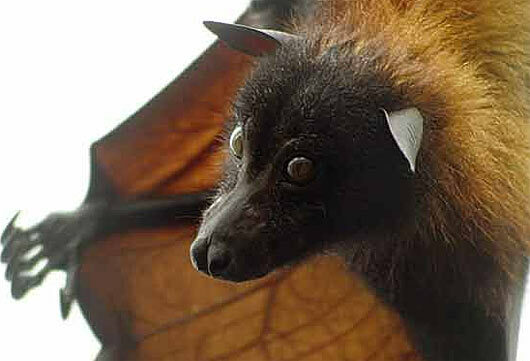 Here’s something biologically interesting: the Malayan flying fox is only warm-blooded when active. At rest, its body temperature drops down to that of its environment! A total of roughly 60 species of bats fall into this category of “flying foxes”, so named because the shape of their head resembles that of a fox. Bats themselves represent the second largest order of mammals, second only to rodents. And what makes bats unique? They are the only mammals capable of flight. Sure, flying squirrels can glide, but bats actually fly by flapping their wings up and down, and do this for up to 50 kilometres (31 miles) in one night in the case of the Malayan flying fox. It weighs between 1.7 and 2 grams (0.06 − 0.07 ounces) and its length is on average 33 millimetres (1.3 inch). It is so small, scientists don’t seem to be sure if it has a tail or not! Such a long-eared bat is native to Europe and North Africa and has the more sensible body length of 5 centimetres (2 inches). But get this: its ears alone can reach 3.8 cm (1.5 in)! 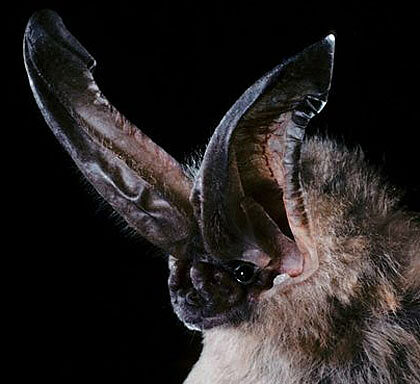 Indeed, these ridiculously long ears—imagine having a pair of ears almost as tall as you—are used by this crafty bat to catch crafty insects. You see, some moths cover their wings with down in order to deaden the sound of their wing flaps. These smart moths think they can fly in silence at night, like the Navy SEALs of the natural world. Wrong! The long-eared bats can hear these ninja moths, home in on them, and turn them into down-covered dinner. Bat: 1; ninja moth: 0. “All this talk of fruits and insects,” I hear you say, “but I always thought bats drank blood.” Well, only a minority of bats do. They are appropriately referred to as “vampire bats”. If you are about to go to bed and hate reading about creepy-crawlies, you might want to skip this paragraph. You see, these New World hematophages (literally “eaters of blood”) don’t fly at cattle, attacking them overtly with wings wide open. No, no, no, no, no. These critters creep up on their prey. They fold up their leathery wings and use them as legs. Slowly, silently, they walk up to the creature whose warm blood they want to drink (rarely humans but, you know, it happens….) and get all nice and cozy. They then perform a small cut through the skin with their teeth. They insert their curled-up tongue into the wound and lap up the blood. Mmm mmm. Best part: these sneaky blood drinkers are rarely detected by their prey. This is ninja vampirism at its most impressive. Well, best part/worst part. You see, the problem is that bats can carry diseases, such as rabies. Rabies is caused by a virus which slowly travels to the central nervous system of its host. From there, it moves on to various organs, including quite prominently the mouth and salivary glands. Approximately 60,000 people die of rabies every year. Almost all cases are in third-world countries: human cases reported in Canada are sporadic, occurring once every few years1. 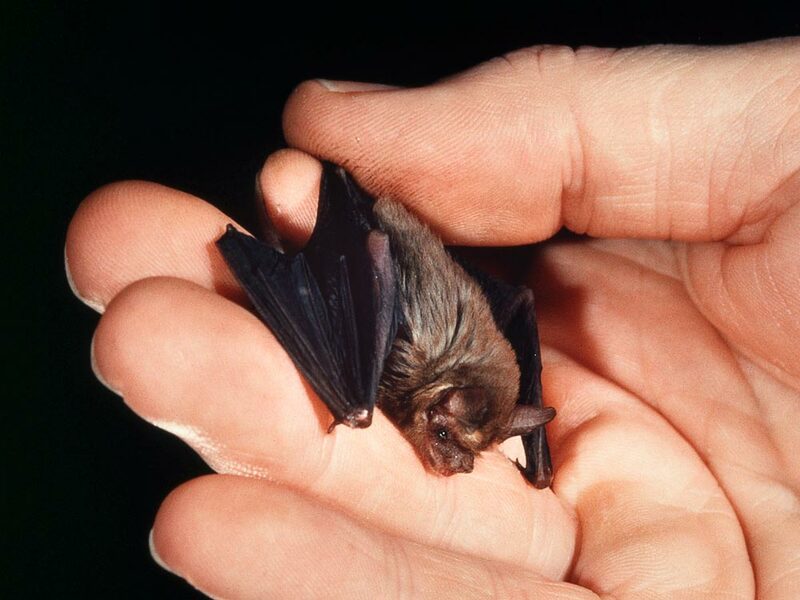 The scary thing about the disease, which is sometimes contracted from an infected bat though more commonly from meat-eating animals (in Canada at least), is that it is almost always fatal in humans. You get it: you die. The only way to avoid death is to get post-exposure prophylaxis, which consists in administering the rabies immunoglobulin and the rabies vaccine between the time of the suspected exposure (bite) and the on-set of the disease. Once the symptoms of the disease start to show, it’s a one-way street to death. This should not serve as an excuse to hate bats with impunity: a recent Canadian study found that roughly 1% of bats carry rabies2. Bats are not the rabid scourge we once thought. Nor are they blind. Although we say of someone that he or she is “blind as a bat”, bats actually have relatively good vision compared to most mammals, so good in fact that most fruit bats use their eyes (and their noses) to find food, not their radar sense (which flying foxes don’t even have). The biological radar known as “echolocation” is used mostly by microbats, which tend to feed on insects, although these small bats are joined by toothed whales, dolphins, shrews, cave swiftlets, and the nocturnal Oilbird in the pantheon of animals possessing the faculty of echolocation. This peculiar sense works by the emission of very rapid clicking sounds. While most echolocating bats produce the sounds through their mouths, some emit these sounds through their noses. Sound waves from these clicks bounce onto trees and insects and back into the two ears of the bat. Because these ears are slightly apart, the timing and loudness of these echoes differ from one ear to the other and this information is used by the bat to infer the position and size of the object in front of it. The sounds a bat produces accelerate as it gets closer to its prey: from 10 to 20 clicks per second during a blind search, the sounds can increase to 200 clicks per second as it nears its meal! Kish is blind and has adapted microbats’ echolocation to teach himself (and an impressive number of blind people through his World Access for the Blind organization) how to interpret echoes to essentially “see” the world. You may wonder if the human brain is equipped to process such delicate aural information. As it turns out, the data generated by echolocating humans like Daniel Kish is processed in the visual cortex of the brain, not the auditory part as one might assume3,4. 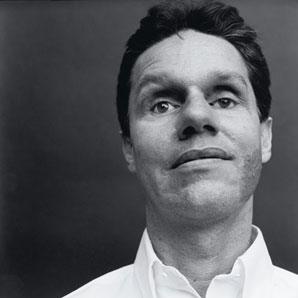 The study was only conducted with two individuals (Kish himself, who became blind shortly after his first birthday, and Brian Bushway, who lost his sight in his teenage years), so it would be interesting to see it reproduced using some of Kish and Bushway’s pupils who are taught how to click and analyze the rebounding echoes. And you thought Batman was fiction…. 1. Canadian Centre for Occupational Health and Safety. “Rabies.” Accessed October 19, 2013. http://www.ccohs.ca/oshanswers/diseases/rabies.html. 2. Science Daily. 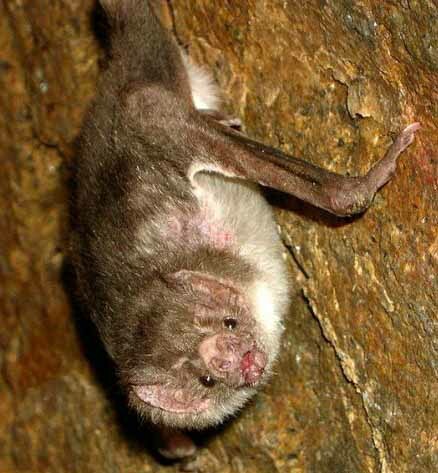 “Fewer Bats Carry Rabies Than Thought.” Accessed October 19, 2013. http://www.sciencedaily.com/releases/2011/01/110131133323.htm. 3. Thaler L, Arnott SR, Goodale MA. 2011. “Neural correlates of natural human echolocation in early and late blind echolocation experts.” PLoS One 6(5):e20162. Available for free at http://www.ncbi.nlm.nih.gov/pmc/articles/PMC3102086/. 4. Yong, Ed. “The brain on sonar – how blind people find their way around with echoes.” Not Exactly Rocket Science, a Discover blog. Accessed October 19, 2013. http://blogs.discovermagazine.com/notrocketscience/2011/05/25/the-brain-on-sonar-%E2%80%93-how-blind-people-find-their-way-around-with-echoes/#.UmgSzCR3_dF. Tags: animals, bats, biology, echolocation, education. Bookmark the permalink.